Why use a Mailing List Software for Marketing? There are numerous advantages to using a mailing list software versus any other form of advertisement. Email Campaigns - Create Email campaigns using the graphical WYSIWYG editor or cut-n-paste your Email campaign from the HTML source directly and Save your Campaigns as a template for future use. Templating - Save your newsletter as a template for future use. HTML & Plain Text - emails are properly formatted to include both versions. Quick Import - Easily Import your database. Personalisation - Dynamically insert custom field data into the email. For example, personalise messages with your subscribers first and last names. 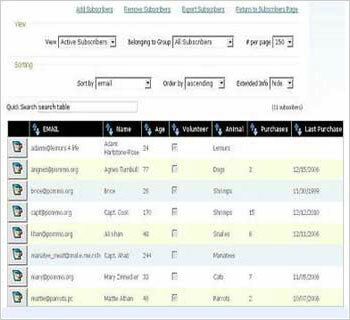 Groups - Create and use groups to filter your list and create Multiple Mailing lists. Custom Field Data - Use custom fields to store subscriber first and last names, location etc; then use this for creating groups and personalization. Throttling - Control the speed of your emails to ensure higher delivery. Pause and Resume Control - Mailings can be paused, resumed, and canceled "live". Resend mails from the Mailing History page. Email tracking is a method for monitoring the email delivery to the intended recipient. SPEEDMAILER uses tracking to reveal the exact time and date that the email was opened alongwith the subject of that Mail Campaign. Email tracking is useful when the sender wants to know if the intended recipient actually received the email. SPEEDMAILER Email Tracking service maintains a unique database which is updated with the exact time and date that the email was read by the recipient of the email. Also our Email Tracking technique is invisible to the recipient; the email recipient will never be prompted to send you a Return Receipt. The Tracking Email feature is FREE. Unlike other Email tracking companies, we do not charge anything from our users to track email. This is a free service for SPEEDMAILER Customers. When ever you send emails to people there is always a chance that the email may not make it to its intended recipient. When this happens, the email is 'bounced' back to the address setup in SPEEDMAILER as the bounce email address. If you continue to send emails to invalid email addresses there is a higher risk of having your IP black listed and not being able to send any more emails from there. Processing your bounced emails will automatically remove the bounced emails from your database so that you do not continue to send to these addresses. This greatly improves the quality of your email campaigns. Freedom - Mailings take place in the background -- you can turn your computer OFF while mails are being sent.